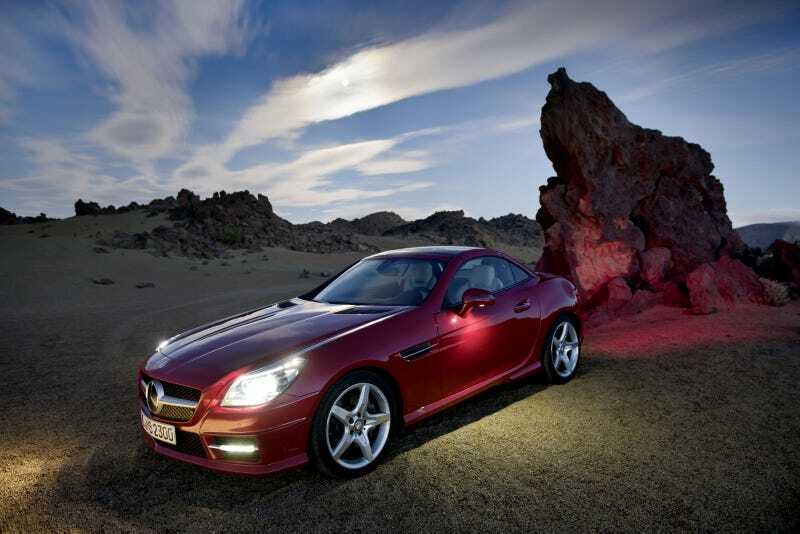 2012 Mercedes-Benz SLK Has "MAGIC SKY CONTROL"
The new 2012 Mercedes SLK has what ze Germans call "MAGIC SKY CONTROL." The feature allows drivers to dim or lighten the convertible's folding glass roof with a touch of a button. The car may also have an engine. Mercedes created the "it" German drop-top in the 1990s with the Mercedes SLK thanks to its folding hard-top and understated teutonic aesthetic. The last refresh added a Formula 1-style nose and this redesign continues the long-snout look, albeit with the new corporate face. In debuting this new version, Mercedes is highlighting the technology and not the performance. First up is "MAGIC SKY CONTROL," which sounds like a project of Hitler's paranormal rocket commanders from Gravity's Rainbow. It's a glass vario-roof that goes from dark-to-light with the flip of a switch. There's also the second-generation of AIRSCARF, which provides warm air around the driver and passenger's necks. For those actually interested in performance, the first SLK350's getting the 302 hp 3.5-liter V6, which is good enough for a quick 5.6-second 0-62 mph sprint. We're waiting to see if we'll get the same 1.8-liter fourbangers offered in Europe, but won't complain as long as we get a giant AMG V8 as well.